With the continued growing popularity of the eXtensible Markup Language (XML), it is clear that large repositories of XML data will soon emerge. Several methods for managing XML databases have emerged, ranging from retrofitting commercial RDBMSs to building native XML database systems. There has naturally been an interest in benchmarking the performance of these systems, and a number of benchmarks have been proposed , , . 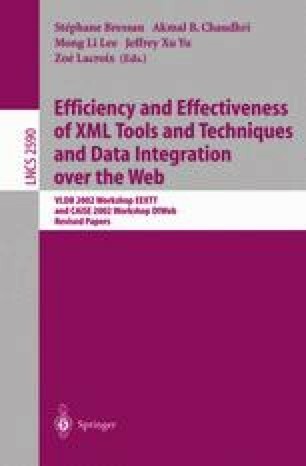 The focus of currently proposed benchmarks is to assess the performance of an XML query processing system when performing a variety of tasks for some representative application. Such benchmarks are valuable to potential users of a database system in providing an indication of the overall performance of the entire application. This work was supported in part by the National Science Foundation under NSF grant IIS-0208852, by an IBM CAS Fellowship, and by a gift donation from IBM.